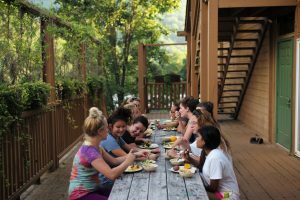 How does Solstice East Help Teens with Social Anxiety? 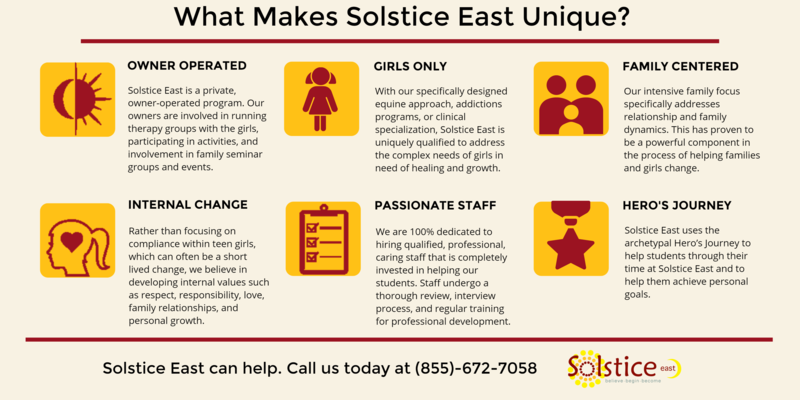 Solstice East is a leading treatment center for teenage girls suffering from social anxiety. Our methods for treatment focus on a dynamic of 3 core values: mind, body, and soul. We believe that the teenager’s entire body should be part of the healing process. Solstice East begins by developing trust and a relationship with our patients. Once trust is established, we can then begin the process of assessing what therapeutic options may be beneficial to each individual. Social anxiety can be a debilitating disorder for teenagers who are experiencing it. Because social anxiety is mind-based, and can make it nearly impossible to function normally, our main course of treatment revolves around mindfulness based cognitive therapy. This type of treatment is deeply rooted in meditation and the calming of the mind. We believe that, mindfulness based cognitive therapy allows a teen to become aware of their inner feelings, physical feelings, and outside surroundings. What are the Causes of Teenage Social Anxiety? Researchers believe that mixes of biological and environmental factors are the cause of social anxiety in teenagers. No single mechanism seems to account for the development of SAD, making it difficult to form a theoretical framework to understand this mental illness. However, taking into consideration the complexity of risk factors believed to play a role, one particular school of thought links biological, psychological, and environmental factors into a diathesis-stress paradigm. Biologically, both by inheriting genetic predispositions from parents, and environmentally, by watching a parent become anxious over a life event, are reasons adolescents develop social anxiety. 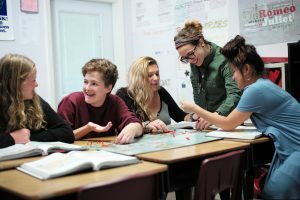 Essentially, teenagers are faced with both a predisposition to anxiety and a stressful environmental or social trigger that causes social anxiety to develop. Triggers for social anxiety involve situations where the person perceives that he or she may be judged or do something potentially embarrassing. Teenagers are facing greater challenges academically. Not only are they expected to turn in high quality assignments, but they are also expected to perform in front of a classroom. Giving presentations in front of a classroom accounts for a large portion of teenagers developing social anxiety. The fear that their teachers and peers will judge them is so great that it debilitates them. Treatment for teenage social anxiety is comprised of mindfulness based cognitive therapy, psychiatric help, diet and exercise changes, and lifestyle changes. Both the mind and body need to work together in order to lessen the effects of social anxiety. A healthy body and lifestyle change in accordance with mindfulness is essential in treating social anxiety in teenagers. Lifestyle changes include: limiting caffeine, getting physically active, adding a healthy diet rich with Omega-3, limiting alcohol intake, quitting smoking, and getting a proper amount of sleep. Mind and body must work together in order for effective treatment to take place. Treatment is comprised of taking gradual steps in helping the teenager face her fears. Slowly building the confidence and having the proper tools in place to face any unknown fearful situation is the key to successful therapy. Stress and Anxiety Relief. This isnât just in equine, but also in therapy with other animals as well. Animals have a way of calming us down and smoothly our nerves over. Equine therapy has also been shown to actually relieve physical ailments associated with mood or anxiety disorders, such as headaches, dizziness, or nausea. MentalHealth.gov The mental health branch of the U.S. Department of Health and Human Services, MentalHealth.gov attempts to educate and guide communities starting at the lowest level and progressing toward politicians and policy-makers. Whether it is informing children or teaching adults, MentalHealth.gov exists to make the world a better place for people with mental illness.